This two record Buddy Holly album, A Rock & Roll Collection was released in 1972 on Decca Records. It includes the following songs: Rave On, Tell Me How, Peggy Sue Got Married, Slippin' and Slidin", Oh Boy!, Not Fade Away, Bo Diddley,What To Do, Heartbeat, Well All Right, Words Of Love, Love's Made A Fool Of You, Reminiscing, Lonesome Tears, Listen To Me, Maybe Baby, Down The Line, That'll Be The Day, Peggy Sue, Brown Eyed Handsome Man, You're So Square, Crying, Waiting, Hoping Ready Teddy and It Doesn't Matter Anymore. In the mid 1950's Holly became unhappy with the achievements and successes during his time with Decca records. He found himself really liking what Buddy Knox had done with Party Doll and Jimmy Bowen's song, I'm Stickin' With You so he went to talk to Norman Petty who had produced and promoted both songs. Holly, Allison, bassist Joe B Mauldin and Niki Sullivan his rhythmn guitar player they went to Petty's studio in Clovis, New Mexico. It was there the group recorded a demo of That'll Be The Day, a song they had previously recored in Nashville. By Holly playing lead guitar they achieved the sound he was after. They signed a management contract with Petty who promptly send the demo to Brunswick Records in New York City. At that time Holly was still under contract with Decca so the could not release the record under his name. Allison came up with the name "Crickets" and that became the bands name and that is how they released that record on Brunswick. Interestingly enough Brunswick gave Holly a basic agreement to release "That'll Be the Day", leaving him with both artistic control and financial responsibility for future recordings. The company was very impressed with the demo, the label's executives released it without recording a new version. "I'm Looking for Someone to Love" was the B-side; the single was credited to the Crickets. 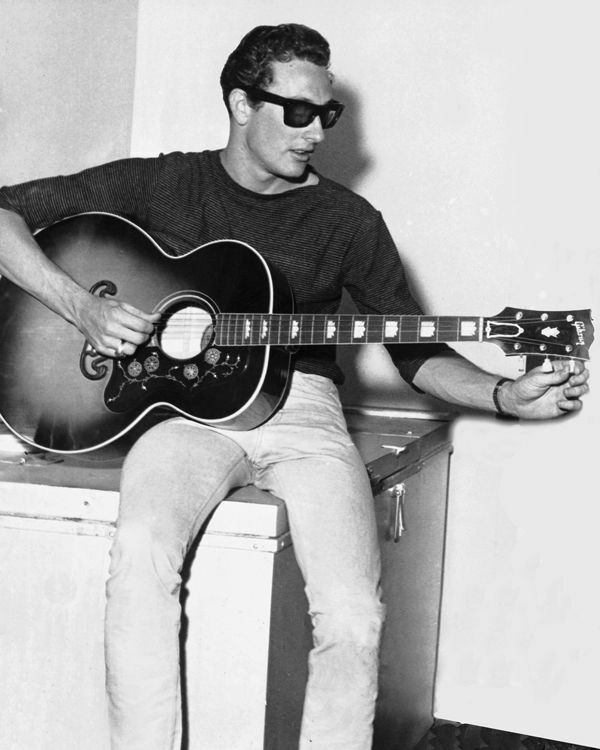 Petty and Holly later learned that Brunswick was a subsidiary of Decca, which legally cleared future recordings under the name Buddy Holly. Recordings credited to the Crickets would be released on Brunswick, while the recordings under Holly's name were released on another subsidiary label, Coral Records. Holly had concurrent contracts with both labels. This complete album sounds very good, both discs are in very good condition. The cover shows shelf wear and the edges of the album cover are worn. But a very good album.